Would you like to reach a wider audience, for free? 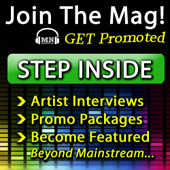 Join our MuzicNotez Battles and appear all over our website, magazine, social pages and mailing lists win or lose! See how you match up against other artists around the world.